Select Plan > Configure > Working Hours and Days. Enter a value in hours. Select the days of the week that make up a work week. The time to complete a task is calculated by multiplying the estimate foritemin the backlog and the number of working hours in a day. 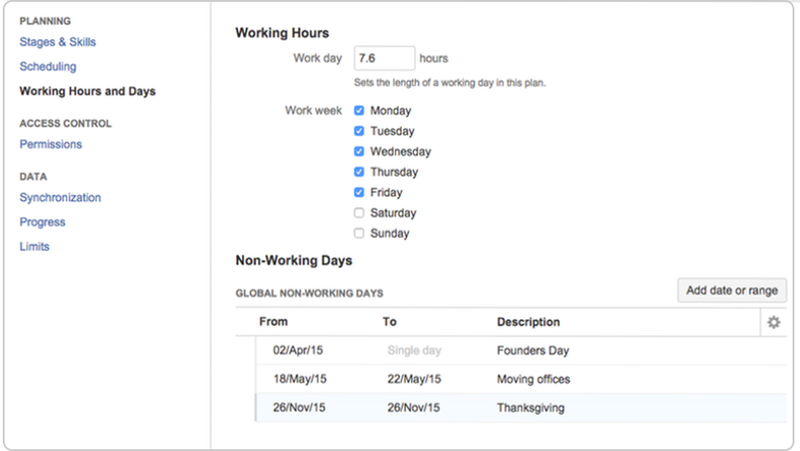 You can also schedule a single or range of days to set as days off, or non-working days. Non-working days are a list of specific dates that are global holidays/absences for every single resource. They overwrite other settings such as presence intervals. In the graphical schedule, non-working days are treated like weekends currently and are filtered out.